Despite record rainfall that turned the Preakness Stakes into the “Pretty Disgusting Stakes” and a dense fog that cast Pimlico Race Track into the perfect setting for a London-based murder-mystery movie, there were some definitive heroes that emerged from the muck, mud, and mist on Saturday afternoon. And, despite all the gloom and doom that one does feel when they stroll onto the grounds of one of the more historic, yet under nourished racing venues in the entire world, the sun and the spotlight did shine bright on some of Thoroughbred Racing’s finest this past Saturday. Justify: The undefeated champion of the 144th running of the Kentucky Derby — who defeated not only 19 would-be rivals on the racetrack, but also the ghost of Derbies past and the 134-year hex bestowed by the late runner Apollo to capture the “Run for the Roses” — was equally as impressive, game, and history-making in the 143rd Preakness. Run that back, a second. Despite what you may read elsewhere, he may have been more impressive. Just consider: One, Justify became the first horse ever to win both the Kentucky Derby and the Preakness Stakes while not starting a single race as a 2-year-old. Two, Justify won despite the fact that the reigning 2-year-old champion, Good Magic, and his accomplished rider, Jose Ortiz, did a gut check on the mega-talented and rising star from the get-go gate to the get-to-stop wire. And, Justify passed the test, putting the Champion away. Consider that for just a second. That was no “rabbit” there. That was no chump. That was the Champ. That was the winner of the Breeders’ Cup Juvenile; the impressive winner of the Blue Grass Stakes; and the Kentucky Derby runner-up. Can I get a wow? Third, Justify had enough run, talent, heart and guts left in his massive tank to hold off all the others in the short, but talented field — despite the fact he practiced jumping mud puddles, and the fact that his Hall of Fame rider, Mike Smith, correctly decided to wrap up on him towards the final yards at the end. Fourth, just a couple of weeks ago, Justify emerged from the Derby with what was later to be determined a “bruised heal.” In short, that, my friends, was one amazing performance by one amazing horse. Do yourself a favor. Take time to enjoy him. These kind don’t come along that often. Sometimes, never in a lifetime. Bob Baffert & Jimmy Barnes: A couple of weeks ago, I wrote that Bob Baffert is one of the best horse trainers of his time. I wondered aloud, though, if history would give him credit as being one of the best of all time. There is little doubt that he is both. Hmm. Make that no doubt. None. Zero. Nada. This Spring, Baffert won his fifth Kentucky Derby. He is just one short of tying the great Ben Jones as the winningest trainer in the long and storied history of the “Greatest Two Minutes in Sports.” On Saturday, with Justify, Baffert captured his seventh Preakness Stakes. That ties the record for most Preakness wins ever set by R.W. Walden — who did it in the 1800s. And now, Baffert is just three weeks and a long 11/2-miles away from winning the Triple Crown — the hardest accomplishment in all of sports — for the second time in four years. Baffert stood side-by-side with the great American Pharoah to pull of the feat in 2015. And, that was the first Triple Crown winner in 37 years. What are the odds that one trainer could win it twice in just four years. Amazing. But plaudits must also go to Baffert’s able-minded assistant, Jimmy Barnes, who left training on his own to join the Baffert stable in 1999. He has been by Baffert’s side and an intregal part of his team ever since — even overcoming a broken pelvis in short order to return to the barn as soon as he could. Barnes, and his wife, Dana, who is one of Baffert’s top exercise riders, have been by many of Baffert’s top horses, as well. Including the great American Pharoah, who Baffert left at Churchill Downs under the careful supervision of the Barnes family throughout the Triple Crown weeks. Now, he is doing the same thing with Justify. You don’t see many teams stay in tact for this long. In 1995, Gary B. Graves, a writer for the Associated Press wrote this quote from Jimmy Barnes: “Bob takes care of me very well, so I don’t even think about going anywhere else…I consider him like a brother. We’ve won a lot of races together, so it’s like a family.” That was written during the time of American Pharoah’s great run. it can still be written today. It’s good to see the “family” still lives on. Mike Smith: Simply put, he is the best jockey in the world of Thoroughbred racing today. A master of pace. A level-headed, cool, calm, collected demeanor in the saddle. And, a rare and gifted talent who can coach a horse to perform their best even when the odds, conditions, circumstances are against them. He displayed all those traits on Saturday, and was both brave and smart enough to save his colt, Justify, at the end for another day. Simply pout, he is the best in the world today. Justify’s Blacksmith Team: A big shoutout to Fran Jurga, owner of “Hoofcare Publishing” and editor of “The Hoof Blog.” After receiving a “Google Alert” that we were inquiring as to the names, and identities of those well-skilled professionals that have cared for Justify, his hooves , and provided him with shoes to wear before each and every big race, Fran reach out to us via email and provided us with the detailed information, and we are happy to pass along to each and all now. According to Fran, here are the details: Fran writes to us: “in your story…you said you were wondering who Justify’s blacksmith was. The answer is that there are several! Wes Champagne at Santa Anita shod him for the Derby. The work done on his hind feet, including the wall reinforcement, was by Curtis Burns (who happened to invent the Polyflex glue shoe, which Shackleford had glued on for his Preakness win, and Curtis also made shoeical glue-on shoes for Curlin, Mucho Macho Man and others — according to Fran) from Florida, who was flown in by Bob Baffert last Sunday (before he left to go to Baltimore for the Preakness Stakes). Much more about the job he did here: https://hoofcare.blogspot.com/2018/05/horseshoe-kentucky-derby-winner-justify-hoof.html. (Article protected by copyright, no re-use of any elements or text without permission). In addition, his front feet were said to be shod before the Preakness by Kentucky horseshoer Todd Boston, but I can’t verify that…Wonder no more…”Thanks to Fran for all the help, information, advice. Be sure to check out the story, once again found here: https://hoofcare.blogspot.com/2018/05/horseshoe-kentucky-derby-winner-justify-hoof.html. It is insightful, and informative. Larry Collmus: This talented race announcer overcame about as many obstacles as the great Justify on Saturday. On a track turned the new official color of the 2018 Triple Crown — “Mississippi River Mud” — and through a fog that would make London and/or Seattle proud, Collmus some how, some way managed to render a riveting call of what may be one of the most thrilling races of the year. Only time will determine its’ importance for the history of the game. But like Travis Stone a couple of weeks before at the wettest Kentucky Derby in history, Collmus was spotless. He hit all the high marks accurately, thrillingly, emotionally. Job well done. D. Wayne Lukas: The Hall of Fame trader held court for much of the week leading up to the Preakness Stakes. He told stories. He gave insight and perspective. He even spoke glowingly of his chief adversary and rival, Bob Baffert and his wonderful steed Justify. In the end of the Preakness Stakes, though, there came running Lukas’ own horse — Bravazo. Splashing through the “mud, blood and the beer,” to quote a Johnny Cash rendering of “A Boy Named Sue,” Bravazo gave everyone a late scare and a late thrill. He finished second. But it was poetic. Baffert and Lukas. Justify and Bravazo. Fighting to the wire. According to “Meanslike.com,” the definition of “Bravazo” is: “The meaning of the given name Bravazo represents practicality, realism, reliability, discipline, sincerity and experience.” How apt a horse to be trained by D. Wayne Lukas. Tenfold & Steve Asmussen: There was a horse in the Preakness more lightly raced than Justify, who now has made five lifetime starts. It was the well-bred Tenfold, a son of Curlin and the Tapit mare Temptress, who was making just his fourth career start. Tenfold was bred and is still owned by Winchell Thoroughbreds — the same folks that gave us the great Gun Runner. On Saturday, Tenfold — despite his inexperience — gave us all a “Gun Runner-like” thrill and experience. At one time on Saturday, within the shadow of the finish line and several small lakes of mud puddles, the colt appeared to be emerging from both the fog and the back of the pack with a real shot to tug on Superman’s cape. Tenfold ended up running third on Saturday, but the real story is that he didn’t fold. Not at all. He emerged. Going into Saturday’s Preakness, Tenfold had run just three previous times, and in only one Stakes event. He won his first two races before a fifth in the Arkansas Derby. He was behind Combatant, a stable buddy, who ran fourth. That one ran 18th in the Kentucky Derby. On Saturday, Tenfold managed to improve his stock by, oh, let’s say, a million-fold? NBC’s Coverage of the Preakness Stakes: As the old saying goes, it is hard to make chicken salad out of chicken parts (or something like that), but on Saturday, NBC’s fine team of experts did just that. They managed to turn a venue that looks more like a condemned building (which it should be) than a racetrack; a racetrack surface that looked more like a river bottom than a racing strip; and a skyline bog that looked more soupy than a bowl of Baltimore’s best clam chowder into, well, a beautiful racing moment. Expert analysis. Wonderful photography. And, spot on interviews. Job well done. Ed DeRosa: On Friday, we launched our weekly interview with the brilliant Director of Marketing at Brisnet.com — the world’s best collection of racing information and data today. In that podcast, Ed announced that he was giving us an “exclusive.” He said that he had not shared this bit of insight and information with any other source or person to date. And, he recanted the story of standing near Steve Asmussen, the Hall of Fame trainer, after Tenfold ran fifth in the Arkansas Derby. According to Ed, Asmussen turned to friends immediately after the race and said that Tenfold would be a handful in the Preakness Stakes. And, Ed DeRosa believed it. As things turned out, the trainer and Ed both were right. And, it made for a very nice trifecta. See, you should listen to Ed DeRosa more. The man nailed the exacta, trifecta, superfecta and the Super High 5. Not a bad day. Alicia Wincze Hughes: On Sunday morning, the day after the Preakness Stakes was run and written, this wonderful and gifted writer and reporter for “The Blood-Horse” sought out, and found the ownership connections of Justify and asked the most important and pointed question of the day and moment. 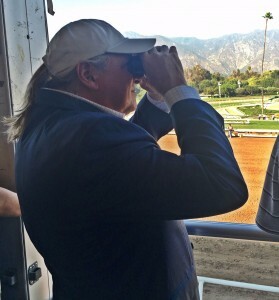 I am paraphrasing, since I was not there to hear, but it went something like this: “Do you guys plan on running Audible against Justify in the Belmont Stakes in three weeks.” You see, WinStar Farm and the China Horse Club — who own Justify along with Head of Plains Partners and Starlight Racing — also own Audible. That’s the same impressive winner of the Florida Derby and the fast-closing third place finisher in the Kentucky Derby. Would they risk losing the Triple Crown, perhaps, to the well-rested, ultra-talented and game Audible? While Alicia got no definitive answer — yet — from WinStar Farm’s Elliott Walden, it was the perfect question for what may be an imperfect situation and dilemma. It gives one pause. It gives one interest. And, it could give this Triple Crown season one more bit of drama.